Many missing-value (MV) imputation methods have been developed for microarray data, but only a few studies have investigated the relationship between MV imputation and classification accuracy. Furthermore, these studies are problematic in fundamental steps such as MV generation and classifier error estimation. In this work, we carry out a model-based study that addresses some of the issues in previous studies. Six popular imputation algorithms, two feature selection methods, and three classification rules are considered. The results suggest that it is beneficial to apply MV imputation when the noise level is high, variance is small, or gene-cluster correlation is strong, under small to moderate MV rates. In these cases, if data quality metrics are available, then it may be helpful to consider the data point with poor quality as missing and apply one of the most robust imputation algorithms to estimate the true signal based on the available high-quality data points. However, at large MV rates, we conclude that imputation methods are not recommended. Regarding the MV rate, our results indicate the presence of a peaking phenomenon: performance of imputation methods actually improves initially as the MV rate increases, but after an optimum point, performance quickly deteriorates with increasing MV rates. Microarray data frequently contain missing values (MVs) because imperfections in data preparation steps (e.g., poor hybridization, chip contamination by dust and scratches) create erroneous and low-quality values, which are usually discarded and referred to as missing. It is common for gene expression data to contain at least 5% MVs and, in many public accessible datasets, more than 60% of the genes have MVs . Microarray gene expression data are usually organized in a matrix form with rows corresponding to the gene probes and columns representing the arrays. Trivial methods to deal with MVs in the microarray data matrix include replacing the MV by zero (given the data being in log domain) or by row average (RAVG). These methods do not make use of the underlying correlation structure of the data and thus often perform poorly in terms of estimation accuracy. Better imputation techniques have been developed to estimate the MVs by exploiting the observed data structure and expression pattern. 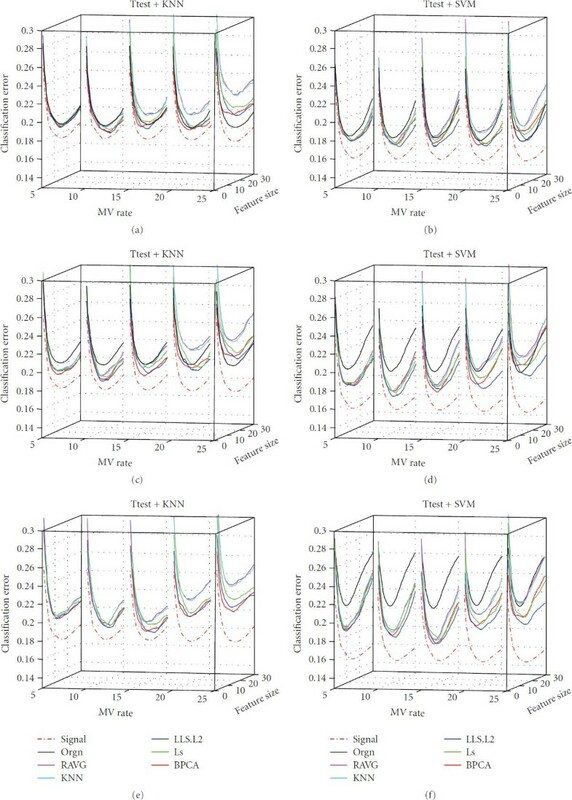 These methods include K-nearest Neighbor imputation (KNNimpute) and singular value decomposition- (SVD-) based imputation , Bayesian principal components analysis (BPCA) , least square regression-based imputation , local least squares imputation (LLS) , and LinCmb imputation , in which the MV is calculated by a convex combination of the estimates given by several existing imputation methods, namely, RAVG, KNNimpute, SVD, and BPCA. 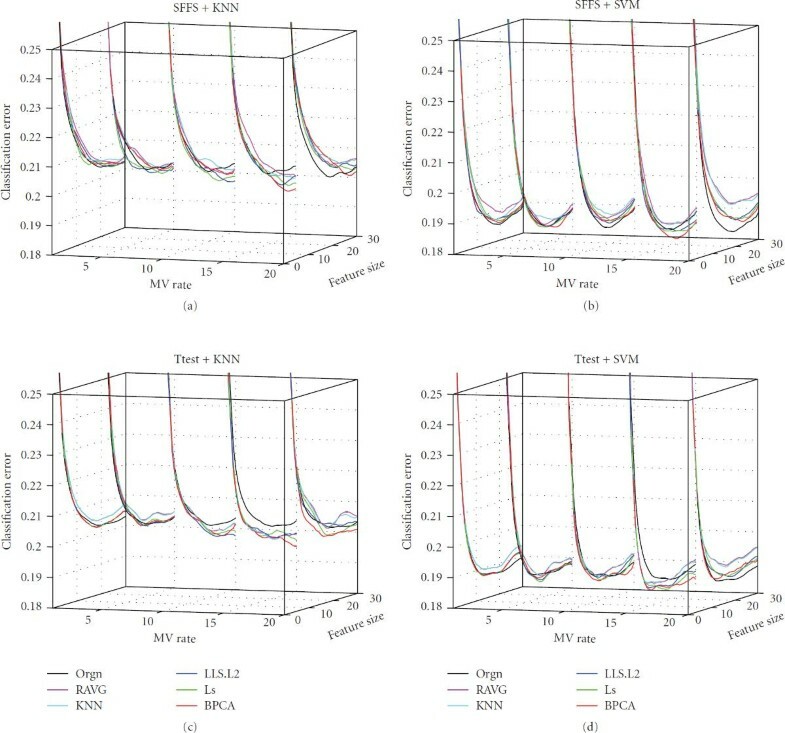 In addition, a nonlinear PCA imputation based on neural networks was proposed for effectively dealing with nonlinearly structured microarray data . Gene ontology-based imputation utilizes information on functional similarities to facilitate the selection of relevant genes for MV estimation . 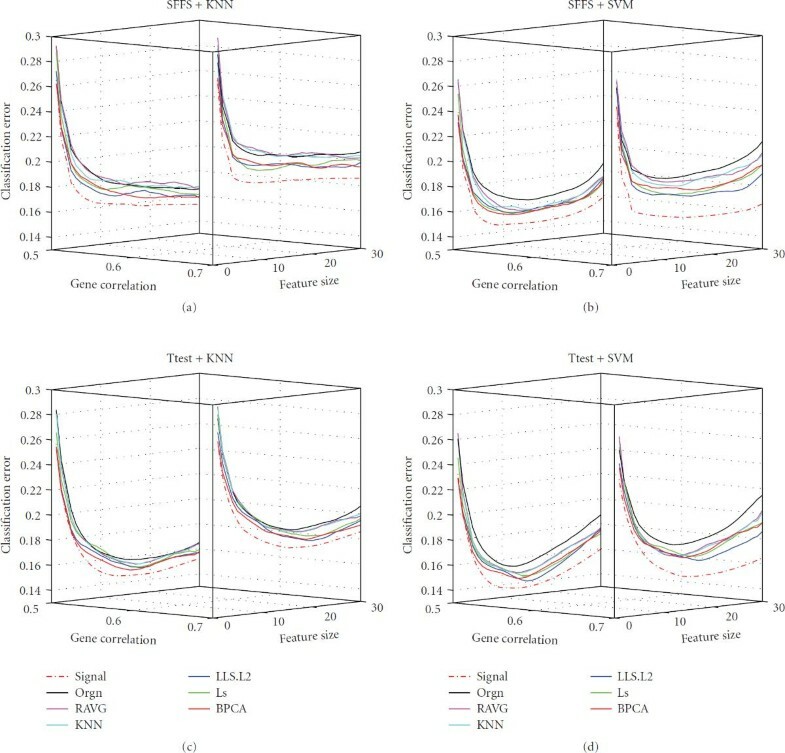 Integrative MV estimation method (iMISS) aims at improving the MV estimation for datasets with limited numbers of samples by incorporating information from multiple microarray datasets . In most of the studies about MV imputation, the performance of various imputation algorithms is compared in terms of the normalized root mean squared error (NRMSE) , which measures how close the imputed value is to the original value. However the problem is that the original value is unknown for the missing data, thus calculating NRMSE is infeasible in practice. To circumvent this problem, all the studies involving NRMSE calculation adopted the following scheme [2, 4–6, 9–11]: first, a subcomplete matrix is extracted from the original MV-contained gene expression matrix; then, entries of the complete matrix are randomly removed to generate the artificial MVs; Finally, MV imputation is applied. The NRMSE can now be calculated to measure the imputation accuracy, since the original values are now known. This method is problematic for two reasons. First, the selection of artificial missing entries is random and thus is independent of the data quality—whereas imputing data spots with low quality is the main scenario in real world. Secondly, in the calculation of the NRMSE, the imputed value is compared against the original, but the original is actually a noised version of the true signal value, and not the true value itself. While much attention has been paid to the imputation accuracy measured by the NRMSE, a few studies have examined the effect of imputation on high-level analyses (such as biomarker identification, sample classification, and gene clustering), which demand that the dataset be complete. For example, the effect of imputation on the selection of differentially expressed genes is examined in [6, 11, 12] and the effect of KNN imputation on hierarchical clustering is considered in , where it is shown that even a small portion of MVs can considerably decrease the stability of gene clusters and stability can be enhanced by applying KNN imputation. The effects of various MV imputation methods on the gene clusters produced by the K-means clustering algorithm are examined in , the main findings being that advanced imputation methods such as KNNimpute, BPCA, and LLS yield similar clustering results, although the imputation accuracies are noticeably different in terms of NRMSE. To our knowledge, only two studies have investigated the relationship between MV imputation of microarray data and classification accuracy. Wang et al. study the effects of MVs and their imputation on classification performance and report no significant difference in the classification accuracy results when KNNimpute, BPCA, or LLS are applied . Five datasets are used: a lymphoma dataset with 20 samples, a breast cancer dataset with 59 samples, a gastric cancer dataset with 132 samples, a liver cancer dataset with 156 samples, and a prostate cancer dataset with 112 samples. The authors consider how differing amounts of MVs may affect classification accuracy for a given dataset, but rather than using the true MV rate, they use the MV rate threshold (MVthld) throughout their study, where, for a given MVthld (MVthld , where ), the genes with MV rate less than MVthld are retained to design the classifiers. As a result, the true MV rate (which is not reported) of the remaining genes does not equal MVthld and, in fact, can be much less than MVthld. Hence, the parameter MVthld may not be a good indicator. Moreover, the authors plot the classification accuracies against a number of values for MVthld, but as MVthld increases, the number of genes retained to design the classifier becomes larger and larger, so that the increase or decrease in the classification accuracy may be largely due to the additional included genes (especially if the genes are marker genes) and may only weakly depend on MVthld. This might explain the nonmonotonicity and the lack of general trends in most of the plots. By studying two real cancer datasets (SRBCT dataset with 83 samples of 4 tumor types, GLIOMA dataset with 50 samples of 4 glioma types), Shi et al. report that the gaps between different imputation methods in terms of classification accuracy increase as the MV rate increases . They test 5 imputation methods (RAVG, KNNimpute, SKNN, ILLS, BPCA ), 4 filter-type feature selection methods ( -test, -test, cluster-based -test, and cluster-based F-test) and 2 classifiers (5NN and LSVM). They have two main findings: ( ) when the MV rate is small ( ), all imputed datasets give similar classification accuracies that are close to that of the original complete dataset; however, the classification performances given by different datasets diverge as the MV rate increases, and ( ) datasets imputed by advanced imputation methods (e.g., BPCA) can reach the same classification accuracy as the original dataset. A fundamental problem with their experimental design is that the MVs are randomly generated on the original complete dataset, which is extracted from the MV-contained gene expression matrix. Although this randomized MV generating scheme is widely used, it ignores the underlying data quality. A critical problem within both aforementioned studies is that all training data and test data are imputed together before classifier design and cross-validation is adopted for the classification process. The test data influences the training data in the imputation stage and the influence is passed to the classifier design stage. Therefore, the test data are involved in the classification design process, which violates the principle of cross-validation. In this paper, we carry out a model-based analysis to investigate how different properties of a dataset influence imputation and classification, and how imputation affects classification performance. 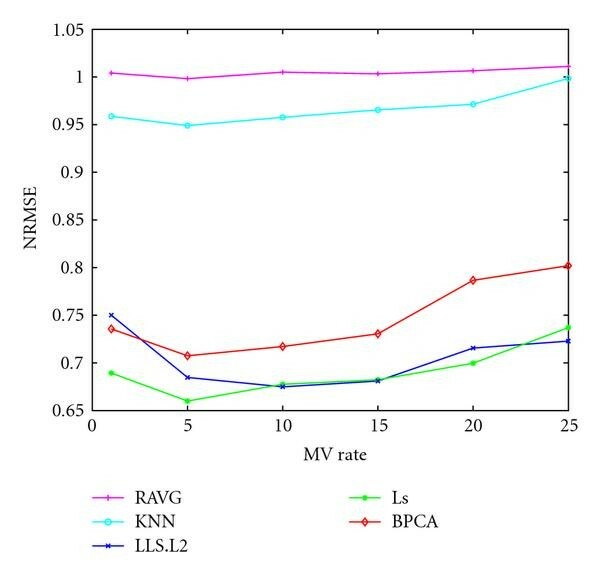 We compare six popular imputation algorithms, namely, RAVG, KNNimpute, LLS.L2, LLS.PC, LS, and BPCA, by measuring how well the imputed dataset can preserve the discriminant power residing in the original dataset. An empirical analysis using real data from cancer microarray studies is also carried out. In addition, the NRMSE-based comparison is included in the study, with a modification in the case of the synthetic data to give an accurate measure. Recommendations for the application of various imputations under different situations are given in Section 3. Many studies have shown the log-normal property of microarray data, that is, the distribution of log-transformed gene expression data approximates a normal distribution [16, 17]. In addition, biological effects which are generally assumed to be multiplicative in the linear scale become additive in the log scale, which simplifies data analysis. Thus, the ANOVA model [18, 19] is widely used, in which the log-transformed gene expression data are represented by a true signal plus multiple sources of additive noise. 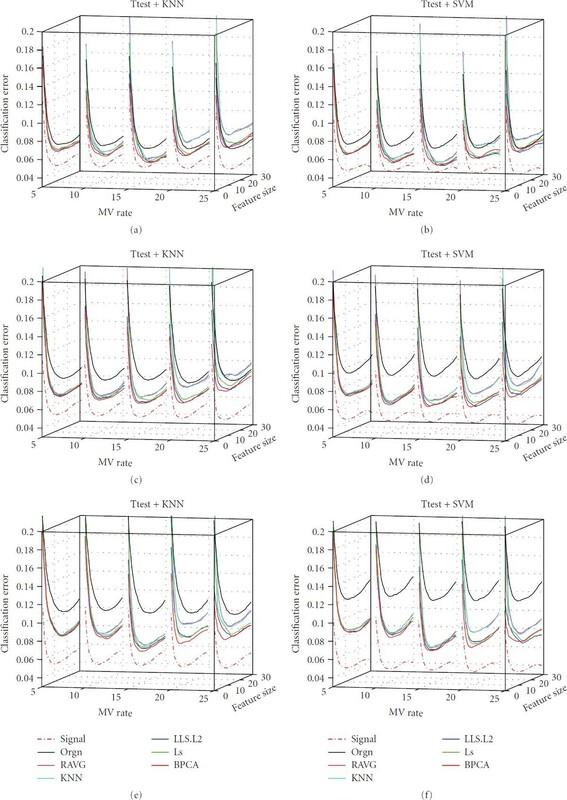 There are other models proposed for gene expression data, including a multiplicative model for gene intensities , a hierarchical model for normalized log ratios , and a binary model . The first two of these models do not take gene-gene correlation into account. In addition, the second model does not model the error sources. The binary model is too simplistic and not sufficient for the MV study in this paper. Based on the log-normal property and inspired by ANOVA, we propose a model for the normalized log-ratio gene expression data which is centered at zero, assuming that any systematic dependencies of the log-ratio values on intensities have been removed by methods such as Lowess [23, 24]. Here, we consider two experimental conditions for the microarray samples (e.g., mutant versus wild-type, diseased versus normal). The model can be easily extended to deal with multiple conditions as well. where represents the log-transformed fold change and is a term introduced to create correlation among the genes. under the constraint that is constant across all the samples in the same class. The parameters and are picked from a univariate Gaussian distribution, , where the mean log-transformed fold change is set to 0.58, corresponding to a 1.5-fold change in the original linear scale, as this is a level of fold change that can be reliably detected . The standard deviation of log-transformed fold change is set to 0.1. In the above equations, the gene block standard deviation , correlation , and size are tunable parameters, the values of which are specified in Section 3. The additive noise in (1) is assumed to be zero-mean Gaussian, . The standard deviation varies from gene to gene and is drawn from an exponential distribution with mean to account for the nonhomogeneous missing value distribution generally observed in real data . The noise level is a tunable parameter, the value of which is specified in Section 3. The threshold is adjusted to give varying rates of missing values in the simulated dataset, as discussed in Section 3. Following the notation of , a gene with MVs to be estimated is called a target gene, with expression values across array samples denoted by the vector . The observable part and the missing part of are denoted by and , respectively. The set of genes used to estimate forms the candidate gene set for . is partitioned into and according to the observable and the missing indexes of . In row average imputation (RAVG), the MVs of the target gene are simply replaced by the average of observed values, that is, . We will discuss three more complex methods, namely, KNNimpute, LLS, and LS imputation, which follow the same two basic steps. For each target gene , genes with expression profiles most similar to the target gene are selected to form the candidate gene set . The missing part of the target gene is estimated by a weighted combination of the corresponding candidate genes . The weights are calculated in different manners for different imputation methods. We will additionally describe briefly the BPCA imputation method. The performance of KNNimpute is closely associated with the number of neighbors used. A value of within the range of 10–20 was empirically recommended, while the performance (in terms of NRMSE) degraded when was either too small or too large . We use the default value of in Section 3. In the first step, either the norm or the absolute value of the Pearson correlation coefficient is employed as the similarity measure for selecting the candidate genes , resulting in two different imputation methods LLS.L2 and LLS.PC, respectively, with the former reported to perform slightly better than the latter. Owing to the similarity of performance, for clarity of presentation we only show LLS.L2 in the results section (the full results including LLS.PC are given on the companion website http://gsp.tamu.edu/Publications/supplementary/sun09a). where denotes the pseudo inverse of matrix . In the first step, similar to LLS.PC, the most correlated genes are selected based on their absolute correlation to the target gene . where denotes the sample covariance between the target and the candidate and is the sample variance of the candidate . The normalized weights are then given by . BPCA is built upon a probabilistic PCA model and employs a variational Bayes algorithm to iteratively estimate the posterior distribution for both the model parameters and the MVs until convergence. The algorithm consists of three primary processes, which are (1) principle component regression, (2) Bayesian estimation, and (3) an expectation-maximization-like repetitive algorithm . The principal components of the gene expression covariance matrix are included in the model parameters, and redundant principal components can be automatically suppressed by using an automatic relevance determination (ARD) prior in the Bayes estimation. Therefore, there is no need to choose the number of principal components one wants to use, and the algorithm is parameter free. We refer the reader to  for more details. Based on the previously described data model, we generate various synthetic microarray datasets by changing the values of the model parameters, corresponding to various noise levels, gene correlations, MV rates, and so on (more details are given in Section 3). The MVs are determined by (6), with the threshold adjusted to give a desired MV rate. For each of the models, the simulation is repeated times. In each repetition, according to (1) and (2), the true signal dataset, , and the measured-expression dataset, , are first generated. The dataset with missing values is then generated based on the data quality of and a given MV rate. Next, six imputation algorithms, namely, RAVG, KNNimpute, LLS.L2, LLS.PC, LS, and BPCA are applied separately to calculate the MVs, yielding six imputed datasets, , for . Each of these training datasets contains genes and array samples and is used to train a number of classifiers separately. For each , a measured-expression test dataset and a missing value dataset are generated independently of, but in an identical fashion to, the datasets and , respectively. Each of these test sets contains genes and array samples, being large in order to achieve a very precise estimate of the actual classification error. A critical issue concerns the manner in which the test data are employed. As noted in the introduction, imputation cannot be applied to the training and test data as a whole. Not only does this make the designed classifier dependent on the test data, it also does not reflect the manner in which the classifier will be employed. Testing involves a single new example, independent of the training data, being labeled by the designed classifier. Thus, error estimation proceeds in the following manner after imputation has been applied to the training data and a classifier designed from the original and imputed values: ( ) an example is selected and adjoined to the measured-expression training set ; ( ) missing values are generated to form the set [note that ]; ( ) imputation is applied to , the purpose being to utilize the training data in the imputation for to obtain the complete vector (the superscript means one imputation method); (4) the designed classifier is applied to and the error ( or ) recorded; (5) the procedure is repeated for all test points; and (6) the estimated error is the total number of errors divided by . Notice that the training data are used in the imputation for the newly observed example, which is part of the classifier. The classifier consists of imputation for the newly observed example following by application of the classifier decision procedure, which has been designed on the training data, independently of the testing example. Overall, the classifier operates on the test example in a manner determined independently of the test example. If the imputation for the test data were independent of the training data, then one would not have to consider imputation as part of the classification rule; however, when the imputation for the test data is dependent on the training data, it must be considered part of the classification rule. The classifier training process includes feature selection, and classifier design based on a given classification rule. Three popular classification rules are used in this paper: Linear Discriminant Analysis (LDA), 3-Nearest Neighbor (3NN) and Linear Support Vector Machine (LSVM). Two feature selection methods, -test and sequential forward floating search (SFFS), are considered in our simulation study. The former is a typical filter method (i.e., it is classifier-independent) while the latter is a standard procedure used in the wrapper method (i.e., it is associated with classifier design and is thus classifier-specific). SFFS is a development of the sequential forward selection(SFS) method. Starting with an empty set , SFS iteratively adds new features to , so that the new set is the best (gives the lowest classification error) among all . The problem with SFS is that a feature added to A early may not work well in combination with others but it cannot be removed from A. SFFS can mitigate the problem by " looking-back" for the features already in set . A feature is removed from if is the best among all , unless , called the "least significant feature", is the most recently added feature. This exclusion continues, one feature at a time, as long as the feature set resulting from removal of the least significant feature is better than the feature set of the same size found earlier in the SFFS procedure . For the wrapper method SFFS, we use bolstered error estimation . In addition, considering the intense computation load requested by SFFS in the high-dimension problems such as microarray classification, a two-stage feature selection algorithm is adopted, in which the -test is applied in the first stage to remove most of the noninformative features and then SFFS is used in the second stage . This two-stage scheme takes advantage of both the filter method and the wrapper method and may even find a better feature subset than directly applying the wrapper method to the full feature set . In summary, for each of the data models, 8 pairs of training and testing datasets are generated and are evaluated by a combination of 2 feature selection algorithms and 3 classification rules, resulting in a very large number of experiments. Each experiment is repeated 150 times, and the average classification error is recorded. The averaged classification error plots for different datasets, feature selection methods and classification rules are shown in Section 3. Besides the classification errors, the NRMSE between the signal dataset and each of the 6 imputed datasets is also recorded. The simulation flow chart is shown in Figure 1. In this way, the aforementioned drawbacks about using NRMSE are addressed. In addition to the synthetic data described in the previous section, we used the two following publicly available datasets from published studies. 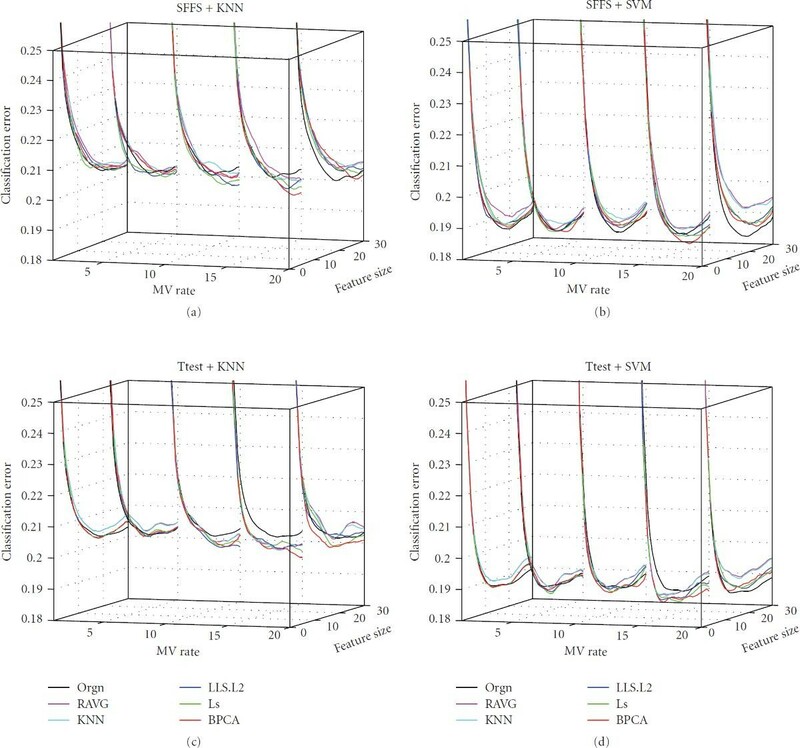 Tumor samples from 295 patients with primary breast carcinomas were studied by using inkjet-synthesized oligonucleotide microarrays which contained 24,479 oligonucleotides probes along with 1281 control probes . The samples are labeled into two groups : 180 samples for poor-prognosis signature group, and 115 samples for good-prognosis signature. In addition to the log-ratio gene expression data, the log error data is also available which can be used to assess the data quality. In the above equations, specifies the red or green channel in the two-dye experiment, and denote the SD of foreground and background pixels, respectively, of the th probe in the th microarray sample, and are the numbers of pixels used in the mean foreground and background calculation, respectively, and and are the mean foreground and background intensities, respectively. For the patient data study, the schemes used for imputation, feature selection and classification are similar to those applied in the synthetic data simulation, except that we use hold-out-based error estimation, that is, in each repetition, samples are randomly chosen from all the samples as the training data and the remaining samples are used to test the trained classifiers, with being much larger than in order to make error estimation precise. We preprocess the data by removing genes which have an unknown or invalid data value in at least one sample (flagged manually and by the processing software). After this preprocessing step, the dataset is complete, with all data values being known. We further preprocess the data by filtering out genes whose expressions do not vary much across all the array samples [13, 35]; indeed, the genes with small expression variance do not have much discrimination power for classification and thus are unlikely to be selected by any feature selection algorithm . The resulting feature sizes are 400 and 500 genes for the prostate and the breast dataset, respectively. It is at this point where we begin our experimental process by generating the MVs. Unlike the synthetic study, the true signal dataset is unknown in the patient data study since the data values are always contaminated by measurement errors. Therefore, in the absence of the true signal dataset, the NRMSE is calculated between the measured dataset and each of the imputed datasets (which is the usual procedure adopted in the literature). Thus the NRMSE result is less reliable in the patient data study, which highlights further the need for evaluating imputation on the basis of other factors, such as classification performance. We have considered the model described in the previous section, for different combinations of parameters, which are displayed in Table 1. 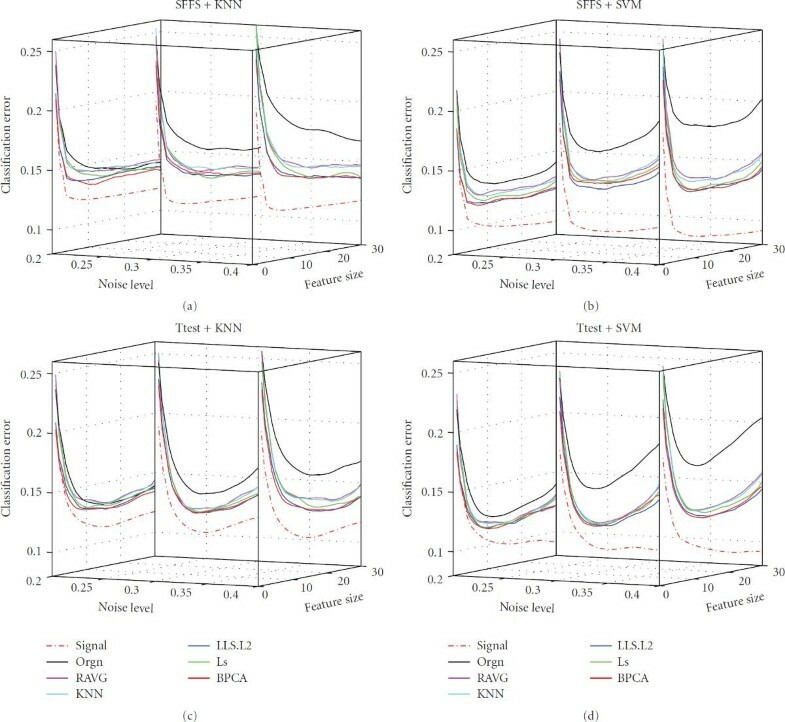 In addition, since the signal dataset is noise-free, the classification performance given by the signal dataset can serve as a benchmark. In the other direction, the benefit of an imputation algorithm is determined by how well imputation improves the classification accuracy of the measured dataset. The classification errors of the true signal dataset, measured dataset, and imputed datasets under different data distributions are shown in Figures 2–7. It should be recognized that the figures are meant to illustrate certain effects and that other model parameters are fixed while the effects of changing a particular parameter are studied. Effect of noise level. 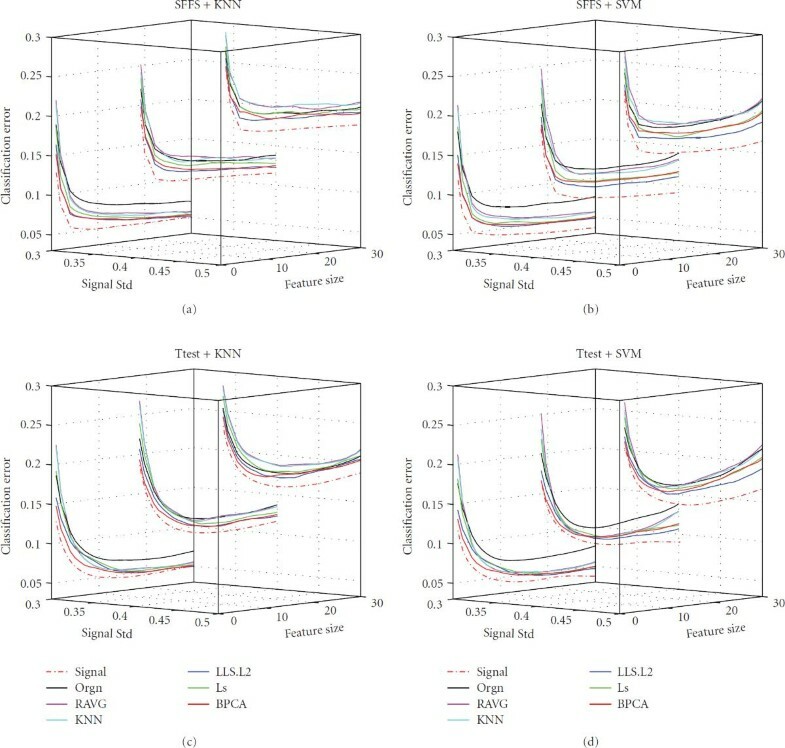 The classification error of the signal dataset (signal), the measured dataset (orgn), and the five imputed datasets. The underlying distribution parameters are SD , gene correlation , MV rate . Each panel in the figure corresponds to one combination of the feature selection methods and the classification rules, which is given by the title. The -axis labels the number of selected genes, the -axis is the noise level, and the -axis is the classification error. Effect of variance. 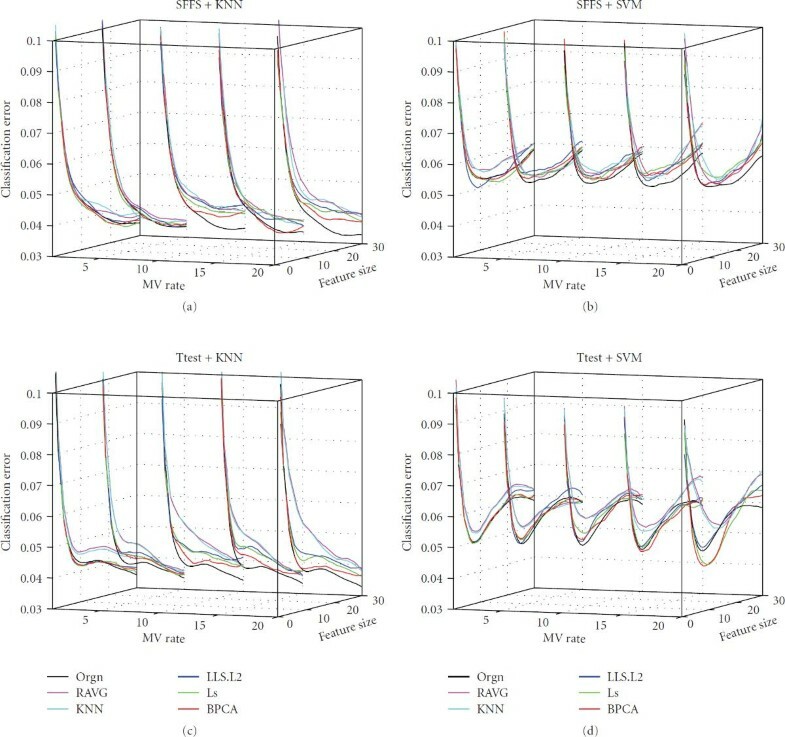 The classification error of the signal dataset (signal), the measured dataset (orgn), and the five imputed datasets. The underlying distribution parameters are noise level , gene correlation , MV rate . Each panel in the figure corresponds to one combination of the feature selection methods and the classification rules, which is given by the title. The -axis labels the number of selected genes, the -axis is the signal SD, and the -axis is the classification error. Effect of correlation. The classification error of the signal dataset (signal), the measured dataset (orgn), and the five imputed datasets. The underlying distribution parameters are SD , noise level , MV rate . Each panel in the figure corresponds to one combination of the feature selection methods and the classification rules, which is given by the title. The -axis labels the number of selected genes, the -axis is the gene correlation strength, and the -axis is the classification error. Effect of MV Rate. The classification error of the signal dataset (signal), the measured dataset (orgn), and the five imputed datasets. The underlying distribution parameters are SD , gene correlation , and noise level for subfigures (a), (b), (c), (d), (e), and (f), respectively. The -axis labels the number of selected genes, the -axis is the MV rate, and the -axis is the classification error. Figure 2 shows the impact of noise level (parameter in the data model) on imputation and classification. 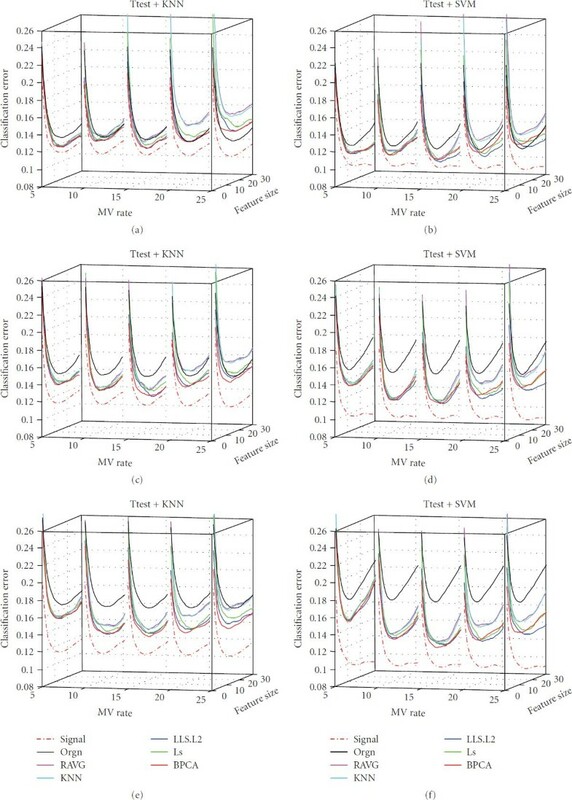 When noise level goes up (from left to right along the -axis), the classification errors (along with the Bayes errors) of the measured dataset and the imputed datasets all increase as expected; the classification errors of the signal dataset stay nearly the same and are consistently the smallest among all the datasets, since the signal dataset is noise-free. 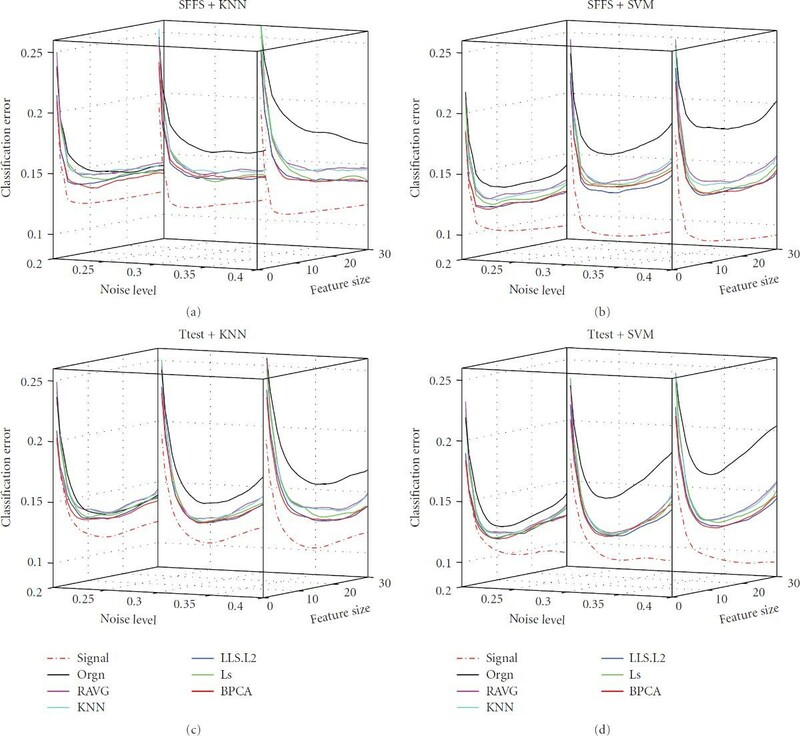 Relative to the signal dataset benchmark, the classification performances of imputed datasets deteriorate less than that of the measured dataset as the noise level increases, although their performances degrade with increasing noise. For the smallest noise level, imputation does little to improve upon the measured dataset. The effect of variance (parameter in the data model) on imputation and classification is shown in Figure 3. As the variance increases, the classification errors of all datasets increase as expected. When the variance is small (e.g., ), all imputed datasets outperform the measured dataset consistently across all the combinations of feature selection methods and classification rules; however, when the variance is relatively large (e.g., ), the measured dataset catches up with and may outperform the datasets imputed by less advanced imputation methods, such as RAVG and KNNimpute. As variance increases, the discriminant power residing in the data is weakened, and the underlying data structure becomes more complex (as confirmed by computing the entropy of the eigenvalues of the covariance matrix of the gene expression matrix , data not shown). Thus it becomes harder for the imputation algorithms to estimate the MVs. In addition, it is observed that the classification performance of one imputed dataset may outperform that of the other imputed dataset for a certain combination of feature-selection method and classification rule, while the performances of the two may reverse for another combination of feature selection and classification rule. For instance, when the classification rule is LDA and the feature selection method is -test, the BPCA imputed dataset outperforms the LLS.L2 imputed dataset; however, the latter outperforms the former when the feature selection method is SFFS and the same classification rule is used (plots on companion website). This suggests that a certain combination of feature-selection method and classification rule may favor one imputation method over another. Figure 4 illustrates the effect of gene correlation (parameter in the data model) on imputation and classification. As the gene correlation goes up, the classification errors of all datasets increase as expected. Although it is not straightforward to compare the classification performances of different datasets under different correlations, we notice that the correlation-based MV imputation methods such as LLS.PC and LS may slightly outperform BPCA in larger correlation cases, suggesting that the local correlation structure of a dataset may be better captured by such methods. Perhaps the most important observations concern the missing value rate, which is determined by adjusting the parameter in (6) to obtain a specified percentage of missing values: . Because we wish to show the effects of two model parameters, we will limit ourselves in the paper to considering 3NN and SVM with -test feature selection. Corresponding results for other cases are on the companion website. 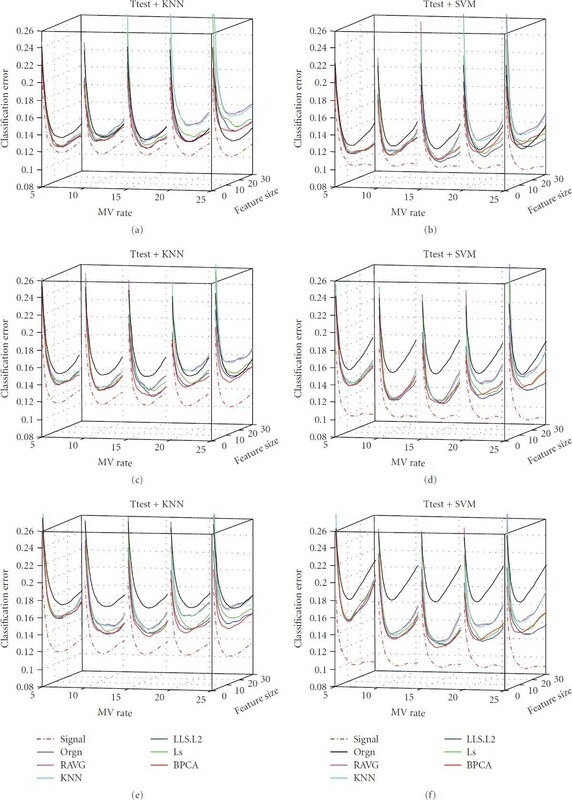 Figures 5, 6, and 7 provide the results for the signal standard deviation , and respectively, with subfigures (a) to (f) of each figure corresponding to noise levels , and , respectively. In all cases, . In Figures 5(a) and 5(b) we observe the following phenomenon: there is improvement on the performance of the various imputation methods as the MV rate initially increases, and then performance deteriorates (quickly, in some cases), as the MV rate continues to increase after a certain point. We shall refer to this phenomenon as the missing-value rate peaking phenomenon. It is important to stress that degradation of performance of imputation at larger MV rates is quite noticeable: at 20% the weaker imputation methods perform worse than the measured data and at 25% imputation is detrimental for kNN and not helpful for SVM. In Figures 5(c) and 5(d) we again observe the MV rate peaking phenomenon; however, imputation performs better relative to the measured data. Imputation remains better throughout for SVM and only gets worse for kNN at MV rate 25%. In Figures 5(e) and 5(f) the peaking phenomenon is again noticeable, but for this noise level imputation is much better relative to the measured data and all imputation methods remain better at all MV rates. Similar trends are observed in Figures 6 and 7, the difference being that as increases from to and , the imputation methods perform increasingly worse with respect to the measured data. Note particularly the degraded performance of the simpler imputation schemes. Figure 8 displays the behavior of NRMSE as a function of MV rate. Here, we also observe a peaking phenomenon for the NRMSE, though a modest one. This is in contrast to previous studies, which all generally report the NRMSE to increase monotonically with increasing MV rate [4, 5, 9, 13]; this may be a consequence of the different way in which the MVs are selected in those studies as compared with the present one; in the former, MVs are picked randomly, whereas in the latter, MVs are picked based on quality considerations, revealing the peaking phenomenon. The NRMSE values ( -axis) of the five imputation algorithms with respect to the MV rate ( -axis). The underlying distribution parameters are: SD , noise level , gene correlation . For the patient data, since the true signal is unknown, we only conduct the comparison of imputations with respect to different MV rates. The effect of MV rate is shown in Figures 9 and 10, for the BREAST and the PROST dataset, respectively. The trends observed are similar to those in the synthetic data study, in the sense that there is a degradation of performance of imputation methods with increasing MV rates. On the other hand, the missing-value rate peaking phenomenon is less evident here, but still present, as can be seen from the fact that the classification performance of LLS, LS, and BPCA imputed datasets in a few cases becomes better under a larger MV rate than the corresponding datasets with a smaller MV rate. The classification errors of the measured prostate cancer dataset (orgn), and the five imputed datasets. Each panel in the figure corresponds to one combination of the feature selection methods and the classification rules, which is given by the title. The -axis labels the number of selected genes, the -axis is the MV rate, and the -axis is the classification error. The classification errors of the measured breast cancer dataset (orgn) and the five imputed datasets. The meanings of the axes and titles are the same as in Figure 9. It is again observed that the classification performances of imputed datasets depend on the underlying combination of feature selection method and classification rule. For example, RAVG and KNNimpute show satisfactory performances for the combinations SFFS + LDA and Ttest + LDA (data not shown) but perform relatively poorly for the other combinations. The NRMSE values of different imputation methods generally decrease first and then increase as the MV rate increases (see Figure 11) which is similar to the trend observed in synthetic data study. It is also found that there is no strong correlation between the low-level performance measure NRMSE and the high-level measure classification error. A small NRMSE may not necessarily suggest a small classification error, that is, an imputation method may perform better than another imputation method in terms of estimation accuracy, but the former may not be as good as the latter in terms of classification performance. In other words, although a given imputation method may be more accurate than another when measured by NRMSE, it might decrease more the discrimination power presents in the original data. We study the effects of MVs and their imputation on classification by using a model-based approach. The model-based approach is employed because it enables systematic study of the complicated microarray data analysis pipeline, including imputation, feature selection and classification. Moreover, it gives us ground truth for the differentially expressed genes, allowing the computation of imputation accuracy and classification error. We also carry out a simulation using real patient data from two cancer studies to complement the findings of the synthetic data study. Our results suggest that it is beneficial to apply MV imputation on the microarray data when the noise level is high, variance is small, or gene-cluster correlation is strong, under small to moderate MV rates. In these cases, if data quality metrics are available, then it may be helpful to consider the data point with poor quality as missing and apply one of the most robust imputation algorithms, such as LLS, and BPCA, to estimate the true signal based on the available high-quality data points, in which case the classifier designed on the imputed dataset with reduced noise may yield better error rates than the one designed on the original dataset. However, at large MV rates, we observed that imputation methods are NOT recommended, and the original measured data yields better classification performance. Regarding MV rate, our results indicate the presence of a peaking phenomenon: performance of imputation methods actually improves initially as the MV rate increases, but after an optimum point is reached, performance quickly deteriorates with increasing MV rates. This was observed very clearly in the synthetic data simulation, and less so with the patient data, even though the phenomenon is still noticeable. As for the NRMSE criterion, which is the figure of merit employed by most studies, we also observe a peaking phenomenon with increasing MV rate, in contrast to previous studies that report the NRMSE to increase monotonically with increasing MV rate; this may be a consequence of the different ways in which the MVs are selected in those studies as compared with the present one; in the former, MVs are picked randomly, whereas we pick MVs based on quality considerations. This work was supported by the National Science Foundation, through NSF awards CCF-0845407 (Braga-Neto) and CCF-0634794 (Dougherty), and by the Partnership for Personalized Medicine.